The cold but sure hands of the law have finally caught up with a young man, Mr. 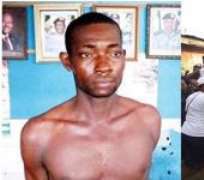 Prince Owabie, popularly called J-boy, who allegedly killed and buried his pregnant girlfriend in his room. The Guardian reports that the victim, Miss Betha Ogbede, was murdered and buried in her lover's one-room apartment in Rumuepirikom community of Obio/Akpor Local Government Area of the state, during her recent visit to Owabie. According to the report, the incident occurred on Sunday, but the suspect was arrested yesterday, by policemen following a tip-off. The Divisional Police Officer (DPO) in charge of Rumuepirikom police station , CSP Emmanuel Wagbara, disclosed that a case of missing person was filed by relative of the victim, who reported that her sister had been missing for a week after her alleged visit to her boyfriend. Wagbara added that the suspect had already been arrested and was assisting the police in their investigations. Neighbours of the suspect said Owabie is a habitual woman beater, adding that he usually beats his girlfriends. The deceased cousin said the victim went to pick her personal belongings from Owabie's residence last Sunday when a hot argument ensued between them, leading to a serious fight, which led to her death. The Rumuepirikom community youth leader, Nyemanu Onuoha, described the incident as unfortunate and promised that the youths would ensure that justice takes its course. Sources said the body of the slain pregnant lady was yet to be exhumed from the suspect's apartment. Security men have been deployed to the suspect's compound to prevent any breakdown of law and order.